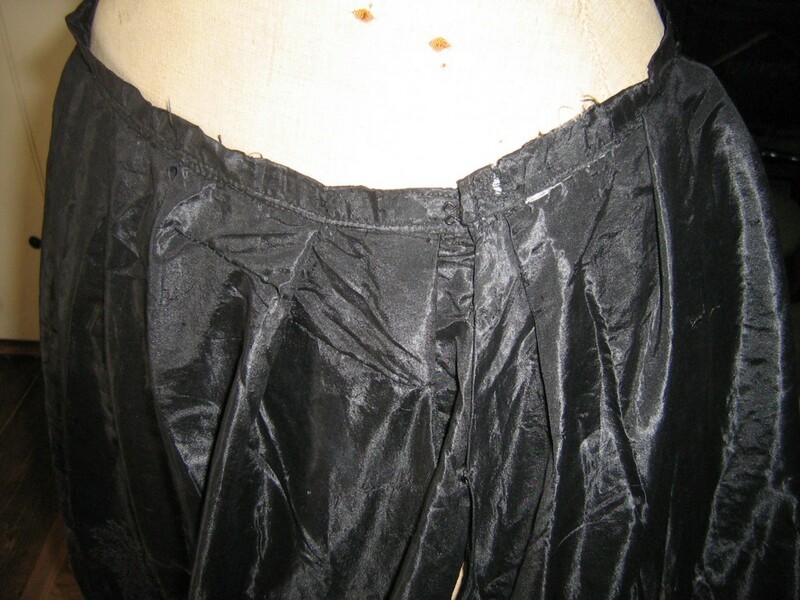 Here is very lightweight antique silk taffeta skirt, with amazing decoration. 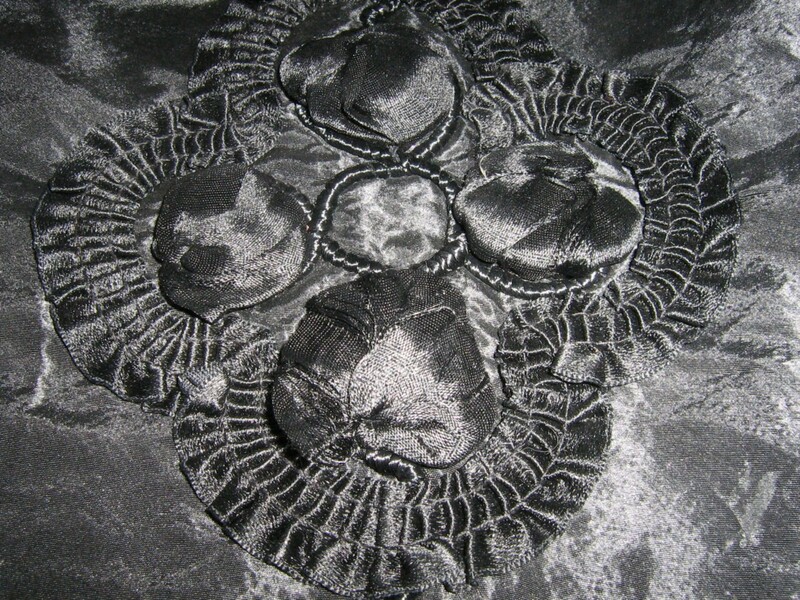 According to the auctioneer is is described as 'intricately decorated with cutwork, couched ribbon ruffles, rope and plaits in the form of repeating medallions'. I couldn't have put it better myself!! 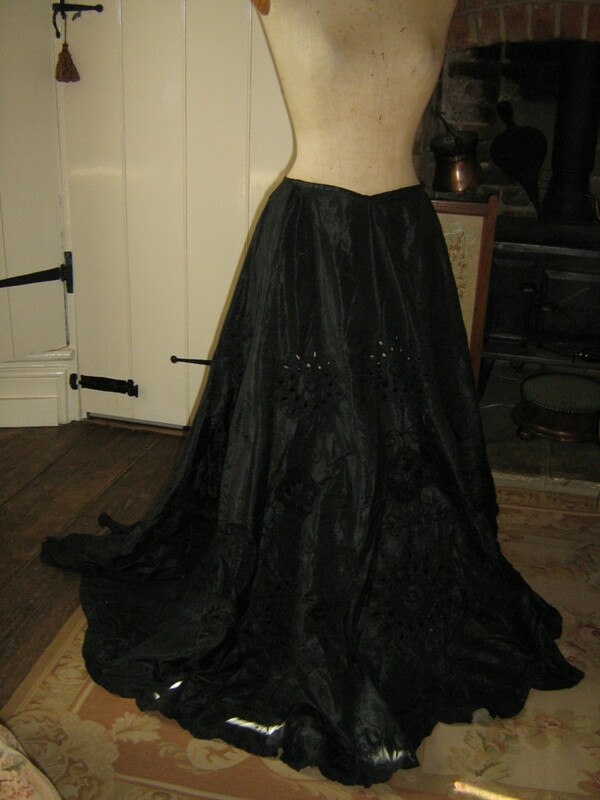 The decoration spans from the lower tummy to the floor, and the skirt begins with a slim waist and widens in panels to almost circular at the bottom. The hem is in ribboned ruffles and then these are scalloped into swags at the floor. The large flowers have a cutwork hole to them, and I wonder if the lady would have worn a bright red petticoat, or similar, for the colour to be glimpsed through the black? Very saucy! Now the skirt is fragile but can be worn occasionally with care if you must. 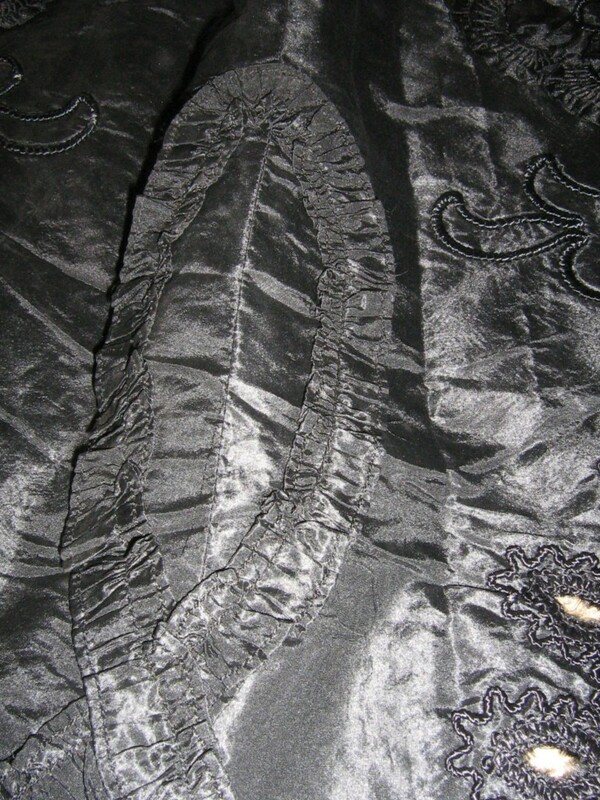 The bulk of the skirt, where one would expect wear, is suprisingly strong and good. It is below the waist, the plain part, that is very thin with a multitude of pinspot holes. 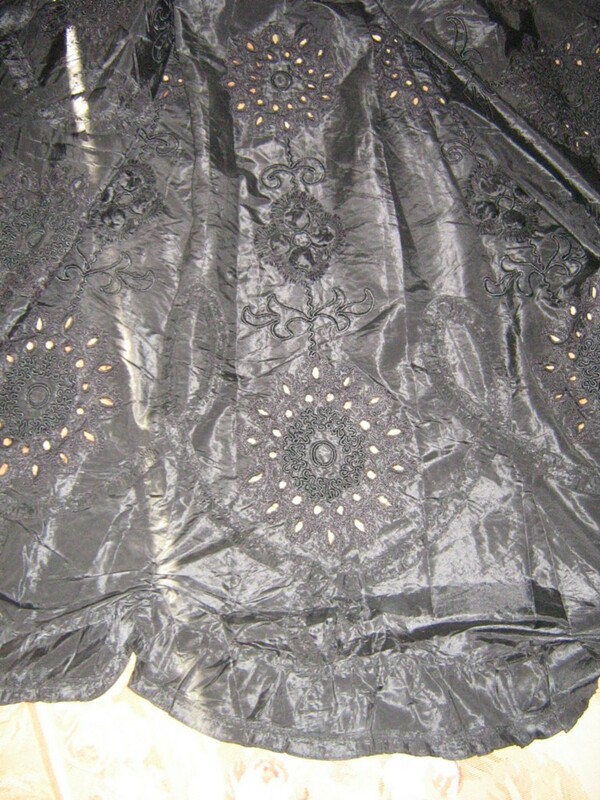 This is of course, because the silk taffeta has had to carry the weight of all the decoration below for many years. There are a few small repairs which are difficult to see and I have seen an unrepaired small hole in this region. I would strongly recommend that you add a short lining section to the upper section, to help bear the weight and on which future repairs can be made. 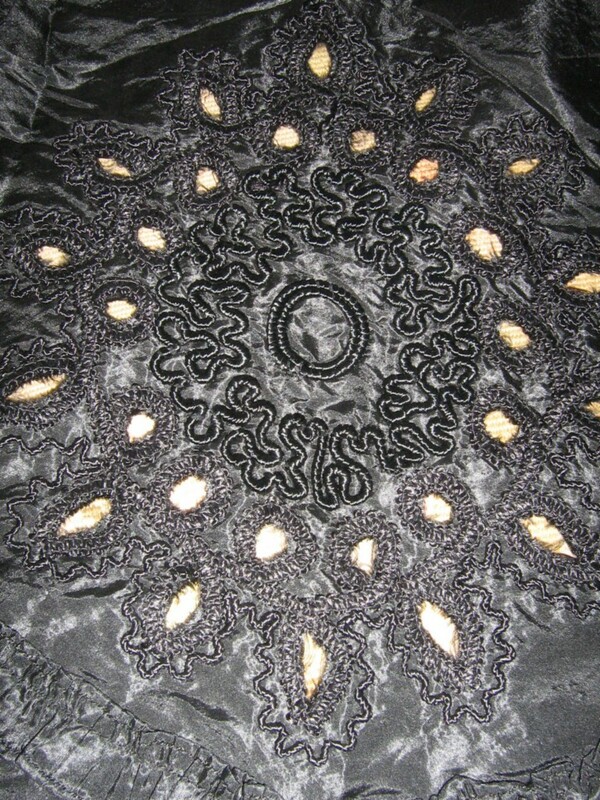 In addition, there is a complete scallop missing at the hem which I have just tacked under. There are also a couple of splits here to close. Barely noticeable as it is so full and fussy here. The waist is sound and fastens with ease. It is actually 28", but if you are over a 26" waist and wear it, you WILL split it. Length is approx 47". Definately not a 'use and throw away' skirt. Too decorative. 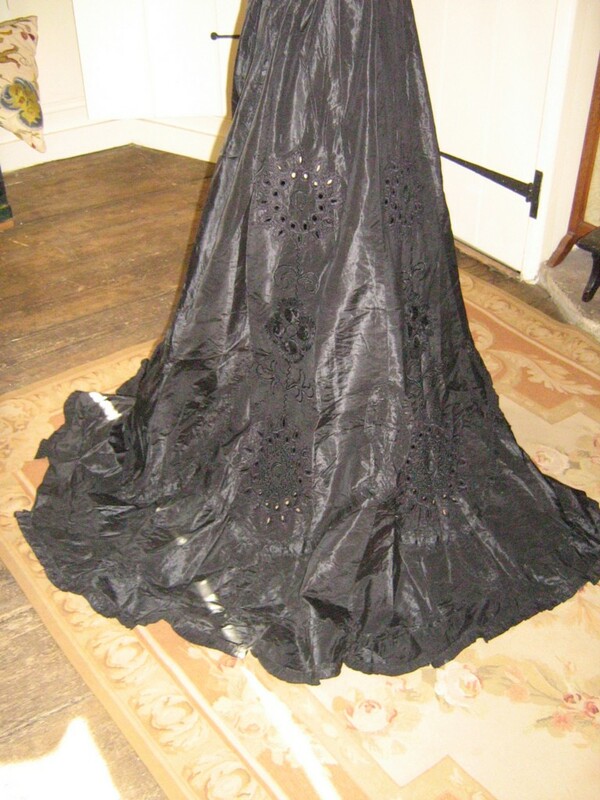 This is either a very late 1890's or early 1900's skirt. I can't imagine what the bodice must have looked like if this is the skirt! 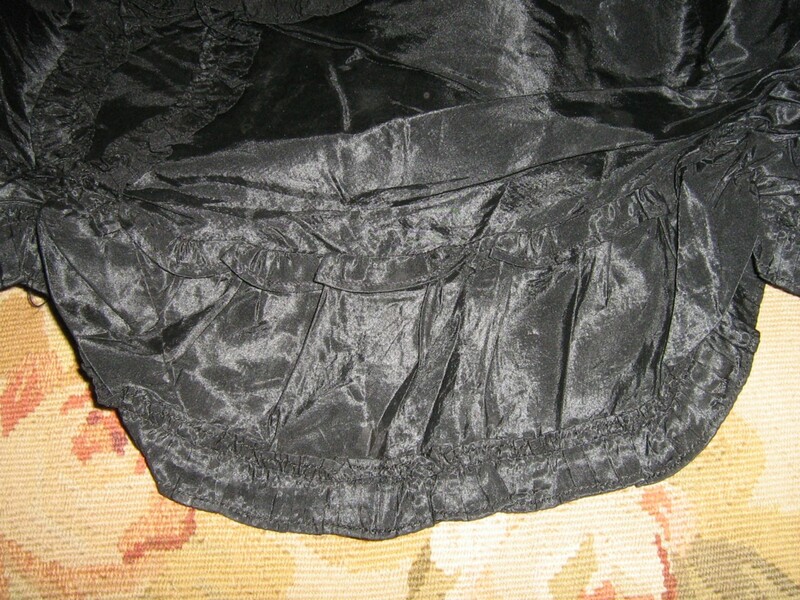 Of course, given the eyelets, a bright colored petticoat would have been worn beneath it.